Sips, Souls & Strolls: Santa Fe Trail at Historic Bellefontaine Cemetery. This event will feature a brief tour of people and points of interest regarding the Santa Fe Trail while enjoying wines, beers and light hors d'oeuvres. This is a "rain or shine" event. See website for more information and to register; $10 donation is suggested, or call 314-381-0750. 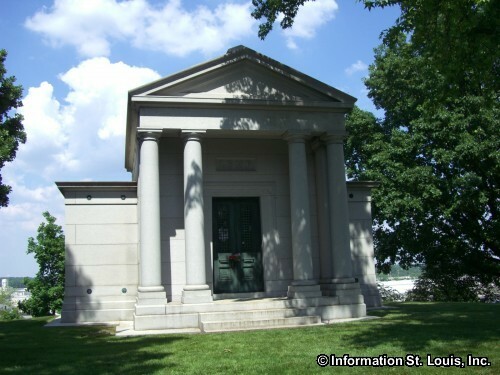 The historic Bellefontaine Cemetery was started in 1849 by a group of prominent men from the city of St. Louis. Almerin Hotchkiss, an associate of Frederick Law Olmsted who designed New York's Central Park, was hired to design the layout of the cemetery. Hotchkiss became friends with Henry Shaw and with his help, the cemetery is now noted to have one of the finest collections of trees in the St. Louis area. Amazing examples of architecture and cemetery art can also be found at Bellefontaine Cemetery, as well as the final resting places for many famous people including Adolphus Busch, of the famed Anheuser-Busch beer brewery; William Clark, famous explorer of the Lewis and Clark Expedition; and James Eads, architect who designed the St. Louis Eads Bridge. Bellefontaine Cemetery is open daily for visiting 8am to 5pm, with extended hours in the summer. The Cemetery hosts many private and public, bus, walking and special themed tours throughout the year. Directions: From I-70, take Exit 245B for West Florissant Avenue. Proceed northwest on West Florissant for 0.7 miles to the cemetery's main entrance, which will be on the right, just after Shreve Avenue and before Kingshighway.